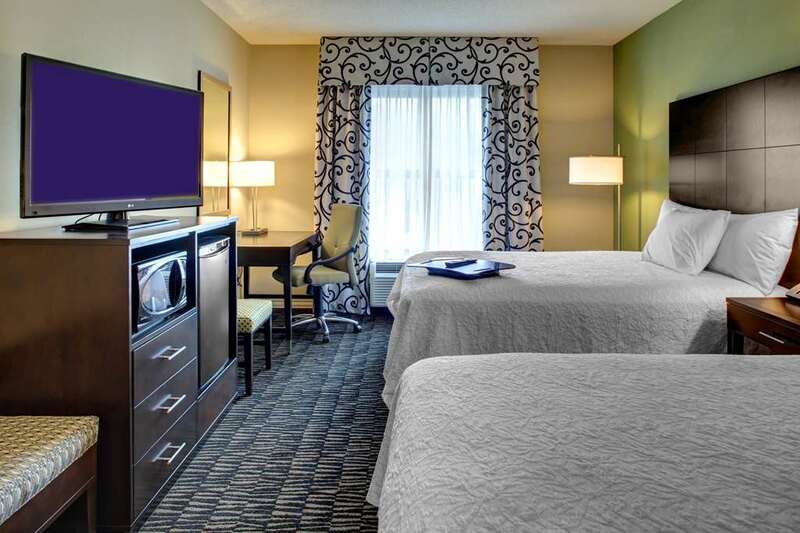 The Hampton Inn and Suites Baton Rouge/Downtown is located in the heart of the bustling downtown business district just steps away from the leisure of the city parks and Town Center. We have 137 professionally decorated guest rooms and suites and offer 2 meeting rooms and a board room for your small business meetings. Our daily free hot breakfast and our on the go breakfast bags offer a variety of choices for every pallet. Our guest rooms range from two double queen beds to corner suites or double king rooms in addition to king studio suites and all come with a variety of complimentary amenities. All rooms offer free local calls coffee maker/coffee/tea hair dryer iron/ironboard and neutrogena bath products. Our guest will rest comfortably in our clean and fresh bedding as well. We are located within walking distance to the state capital state offices and minutes to LSU Tiger Stadium and LSU Campus. We are also steps away from the Town Center where guests will enjoy live concerts and weekend festivals in addition to local activities for families. Parking for guest is available in the parking garage located across the street in the pay to park public parking garage. We are also within walking distance to a variety of restaurants and bars.